Consist of rock line Granite, basalt etc. Density 2.5 - 3 gm/cc. Below crust is mantle divide into outer and inner part. Outer part extends up to 660 km. Inner part extends up to 2900 km. 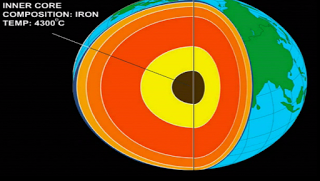 It have two parts Inner core and Outer core. 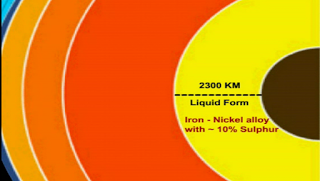 Inner core is solid and composition consist of Nickel and Iron. 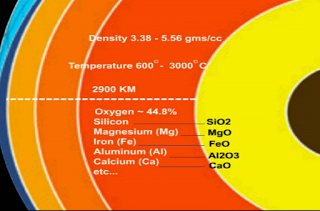 Outer Core is Liquid zone. 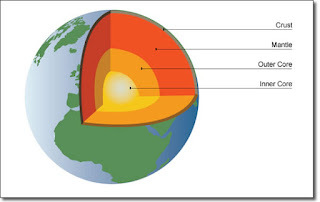 Radius of Inner core - 1290 km. 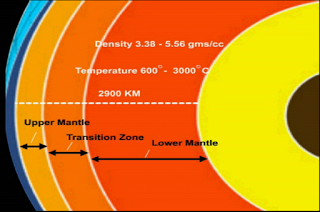 Outer core thickness -2300 km.